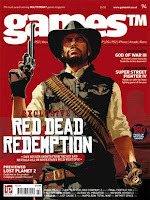 Interesting reading in 'Games TM' magazine this month (number 95, with Red Dead Redemption on the front cover). In it there's a quote from Jens Matthies, creative director of Machinegames. The discussion is around violence in videogames... Matthies says that violence isn't necessarily the reason non-gamers don't play games, but rather the gaming knowledge needed to start hasn't developed. Definately no arguments here! Now, the quote - "I remember we tried testing The Darkness with a group of non-gamers and it was a complete disaster. They couldn't even work out how to leave the first room. They just didn't understand the controls or how to interact with the game". I've not played The Darkness, but the concept of playtesting a complex 1st person shooter with non-gamers is... interesting. The playtesters would need to get some help to get going, and they'd spend their time coming to terms with the concept, rather than the game. The key question you must ask before recruiting for playtesting - who's your audience? If the developers of The Darkness were genuinely targeting non-gamers from the outset it's a valid to bring in non-gamers... And the results should have led to some major design adjustments. If the game isn't aimed at 'non-gamers' - what will you gain by playtesting with them? Everything you test will have a target audience. That is who will be using the product, that is who will buy the product. So make sure they can use it. If you have some extra budget, perform more rounds of testing, don't expand the playtesting audience to see how you can do in other demographics. Additional rounds of testing allow you to "mark your homework" - you can check and see how well your changes fix the problems encountered, and make sure no new problems are introduced.